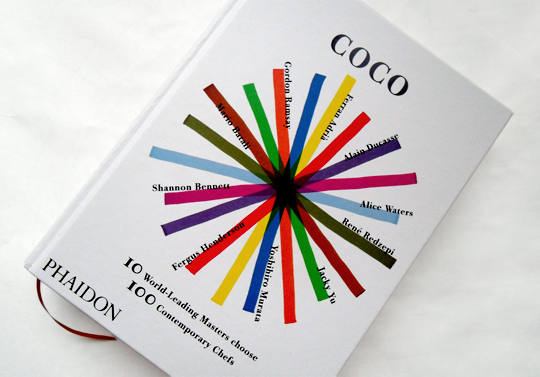 One of the most beautiful books to come into my possession in recent months has been the Coco book by Phaidon (see here). The book features ten master chefs (including Mario Batali, Ferran Adria, and Fergus Henderson) who write essays about their ten favorite chefs (100 chefs total); there are gorgeous pictures, recipes and a singular design (our art savvy friend who works at the Guggenheim couldn’t stop raving when she saw this book). And now the book can be yours! To win it, cook a dish worthy of a master chef–take pictures–and share the experience and the results in The Community Blog. You’ll be graded on the difficulty of the dish you choose, your storytelling ability (so even if your dish fails, still enter) and the impressiveness of your finished product. You have until Sunday (the 25th) at midnight to enter. May the most masterful among you win!